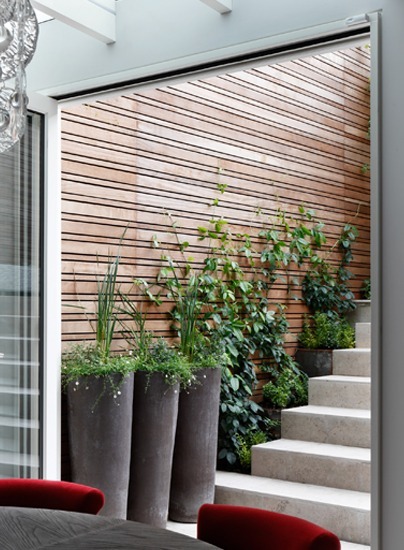 We have designed this fencing to be both static and dynamic at the same time. 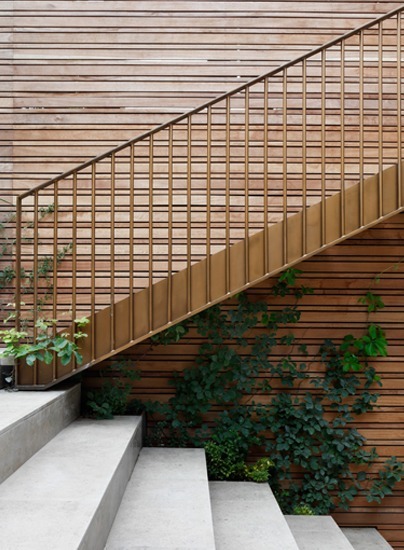 It is made up of rotating timber parts, and this makes it very much more interesting than an ordinary timber fence. The iroko timbers rotate individually, an effect further accentuated by uplighting. 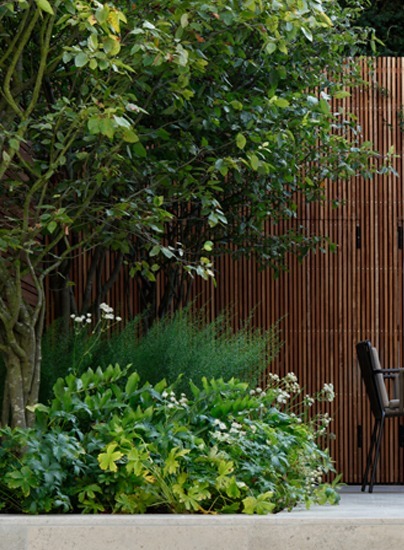 The light showing through gaps between the timbers mimics the effect of the flames of the fire pit when it is in use. 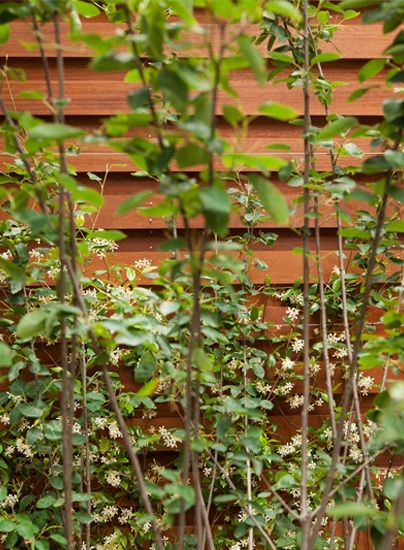 The warm tone of this fence creates a lovely backdrop for the evergreen jasmine that grows over it. 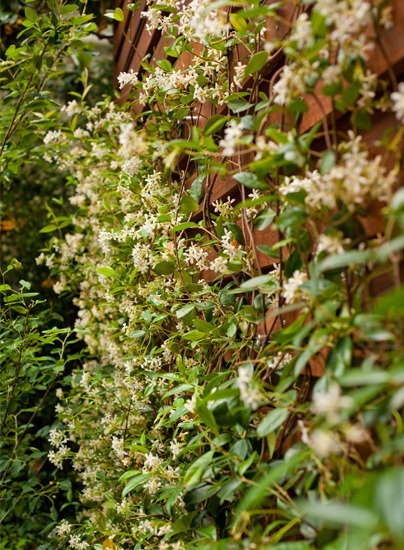 In summer the jasmine’s white flowers will blur and soften the contrast between the dark leaves and the colourful fence, and it will be an interesting feature all year round. 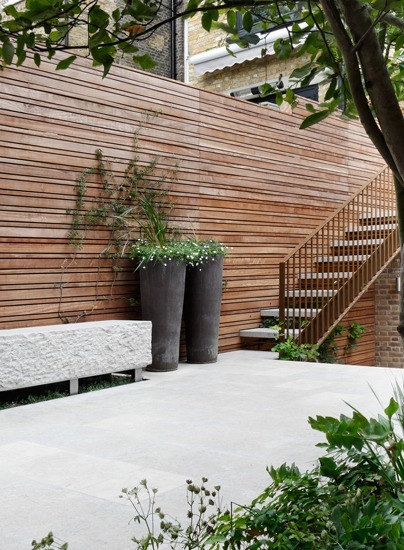 This simple iroko timber fence doubles as an attractive feature and a means of concealing air conditioning units as well as a storage space at the far end of the garden. 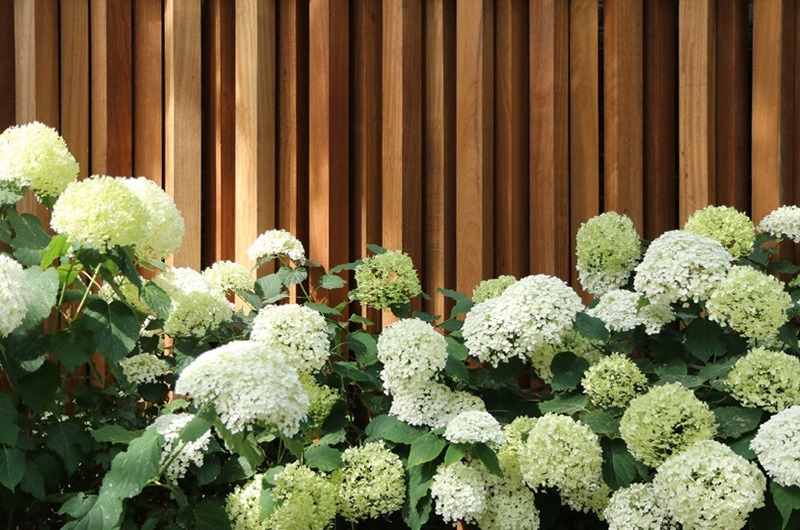 In Cresswell Place, we created a frame of iroko fencing for a green canvas of evergreen jasmines and formal planting featuring alliums. We left a 2cm gap between the timbers, to create a softer look and leave space for climbers to grow. 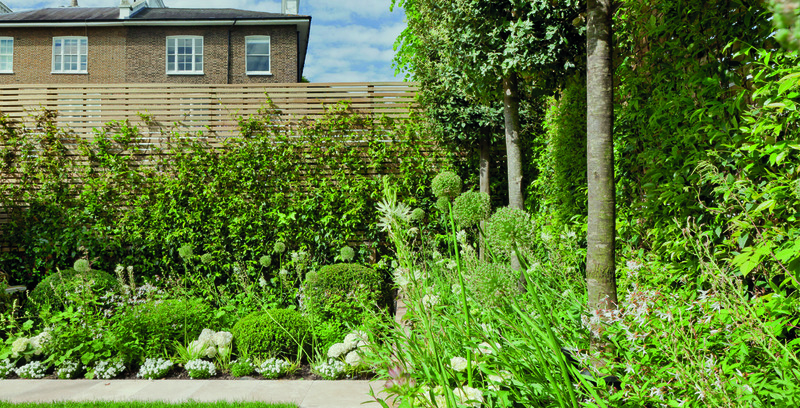 The fence at Ilchester Place surrounds the rectangular garden at a height of 3m, with an additional 1.2 m extension on top of an existing brick wall. 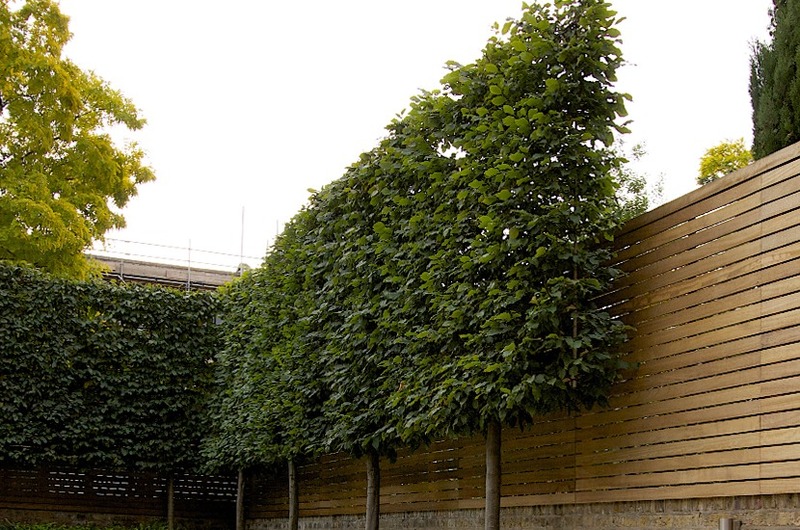 There is usually a limit to the height of any structure built on a party wall, and so we decided to use pleached trees in front of the fence, increasing the overall height of the screen up to 3.5m. 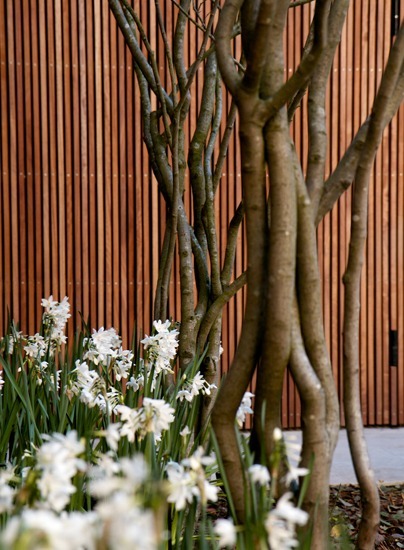 The trees and the iroko fence work particularly well together, effectively screening our client from neighbours on all sides.